George Somi has been fascinated by music since the age of three, when, according to his mother, he climbed atop a piano bench and played "Happy Birthday" after watching someone else do the same. By the age of five, he acquired his first small keyboard and the rest is history. George began formal study of piano at the age of seven. After four years of lessons, he broke off to teach himself. Listening and watching intently to internalize as much music as he could, he continued his independent study of music throughout his adolescence. At 10 years old, George began playing the saxophone in school wind ensembles. He continued playing both piano and saxophone in high school, earning the opportunity to represent his school and region in honor bands throughout Arizona. Seeking to widen his breadth of musical ability, George also pursued jazz and continued his study through his 20s, eventually leading to playing gigs with professional artists in Arizona and Colorado. In addition to playing music, George enjoys creating music. He has had original musical ideas bumping around in his head as long as he could remember, eventually leading him to compose for and win a young composer's competition in the state of Arizona at the age of 12. 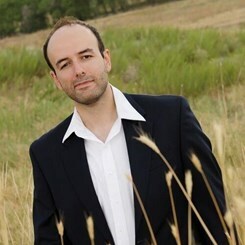 Since then, George has written dozens of pieces for various ensembles. His work has been premiered throughout the country, ranging in breadth from chamber and solo works to full orchestra, choir, and ethnic ensembles. George is currently a resident composer of the Mesopotamian Night Organization, a concert series that highlights Assyrian arts and music. He previously served as the resident composer of Presidio Dance Theatre, a critically acclaimed ballet company in San Francisco, where he composed a full-length, original ballet. George seeks to impart his love of music onto his students and particularly enjoys highlighting the hidden nuances of music. Seeing his students' eyes light up at the discovery of those nuances, as his once did, is one of George's greatest joys.